There's so many things i love about Autumn, the fact we can get out our snuggle jumpers and pj's back out, the spicy scented candles reappear and the evening hot chocolates come back out to play, its just so lovely. I also get really into baking and cooking when it's cooler, there's nothing like a home baked gingerbread man or stew that wont make you love and appreciate that its Autumn time. It's all about the hot chocolates and cups of tea with biccy's to dunk for me, although I do enjoy a gingerbread latte when I'm out and about Christmas shopping!! I'm a huge candle fan as it is, my house is full of them!! But in Autumn i love to stock up on lots of berry, cinnamon and spicy scented candles, it just makes your house smell so warming and wintry. I must admit I'm not a huge lipstick wearer in the Autumn, I'm all about lip balms to keep my lips nice and moisturised so they wont chap in the colder weather however, i do love the berry red colours on a day when i fancy wearing some lippy. My favourite at the moment is MUA shade 1, check out the full review here. I will just be sticking to my trusty moisturiser which is my 'Simple Rich Moisteriser'. Go to colour for your eyes? I'm all about the neutrals, usually i mix and match the shades in my Urban Decay Naked Palette but i just recently got a Mac Quad Palette so I'm sure ill throw All That Glitters and Satin Taupe into the mix as well. This is super easy for me, I'm all about pretty dresses with thick tights, boots and a chunky knitted cardigan to throw over the top. Hmmm my Autumn treat will probably be a nice new coat and some new winter boots. I've also been eyeing up the Mac Cranberry eye shadow too, naughty me. As cheesy as it might sound, but my favourite place to be in the Autumn is snuggled up on the sofa with my boyfriend watching a movie, preferably either the Harry Potter's or Home Alone 1 and 2 as they always make me feel all cosy and ready for the colder month's. 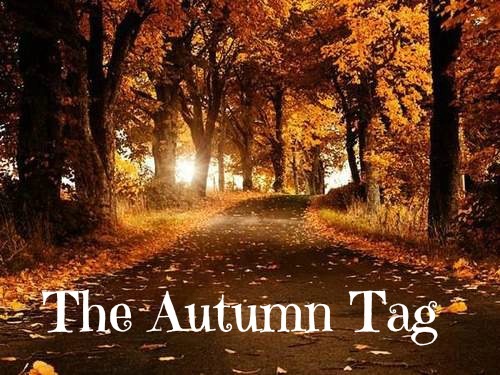 I hope you enjoyed reading my take on the Autumn Tag!!! I tag everyone who reads this to get involved and to get excited about Autumn!! I love autumn candles, Ive already stocked up on my spiced apple and cinnamon scents! Great post! I love everything about Autumn and I get so into reading these types of posts!